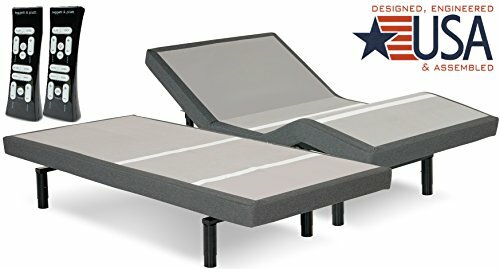 Pragmatic 14" High Profile Dual Adjustable Steel Bed Frame with Under-Bed Storage, Easy No Tools AssemblyCategory: Dual Adjustable BedsThe Pragmatic Adjustable Bed Frame is your ultimate sleeping solution. The foldable bed frame in multiple sizes features an innovative design that allows for effortless adjustment of the head and foot sections to a full range of positions - all at the touch of a button. An adjustable bed can provide many health benefits, including improved circulation, relieved back pain, lower blood pressure, reduced acid reflux and restful post-surgery healing. The Pragmatic Adjustable Bed Frame also makes it easy to watch TV, read a book, work on a laptop or just lounge comfortably in bed. And just like all Pragma Beds, the Pragmatic The Pragmatic Adjustable Bed Frame requires no tools for assembly, sits 14 inches off the ground and can be conveniently folded away for transportation or storage. 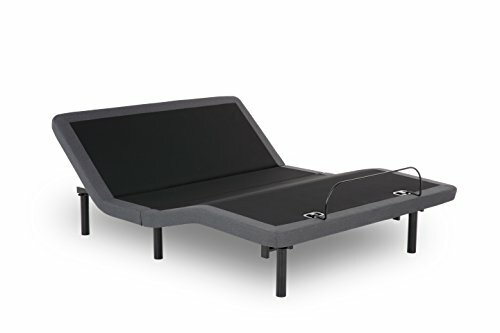 Lucid L300 Adjustable Bed Base with Dual USB Charging PortsCategory: Dual Adjustable BedsIf you have ever assembled a piece of furniture with only an allen wrench, then you’ll love the quick assembly design of the LUCID L300 Adjustable Bed Base. Featuring a unique hinge, this motorized bed base is lightweight and easy to set up in about 5 minutes. No messy cords or complicated instructions. Just screw on a couple legs and plug it in. Now you can take your Netflix movie night, detective novel, and breakfast in bed to a new level of comfort. Other exciting features include independent head and foot incline, dual USB charging ports, wireless remote with flashlight, and a programmable memory position. The motor is whisper-quiet and will not interrupt your favorite TV show. The attractive upholstered frame adds to the style of your master suite. The bed base is backed by a 10-year warranty and is available in King, Queen and Twin XL sizes. 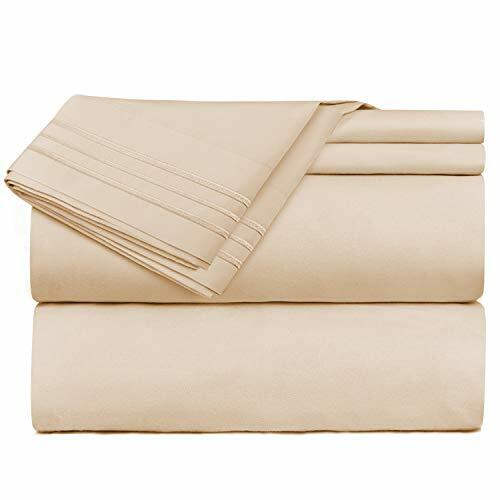 Remember 2 Twin XL bases make a King size bed. Just push them together for individualized comfort for you and your partner or sync them with the wireless remote control. Queen measures 59.5 x 79.5 inches. 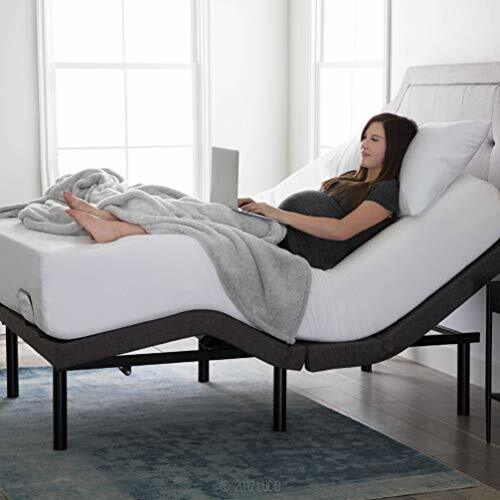 Modern Sleep Adjustable Comfort Upholstered Adjustable Bed Base with Massage, Ergonomic, Wireless Remote, Three Leg Heights, and USB PortsCategory: Dual Adjustable BedsAdd an Adjustable Comfort Bed Base and transform your bedroom into the most used room in the house. Enjoy lifestyle benefits, including watching TV, reading, working on laptop and more. Plus the benefit of knowing that you are breathing properly, decreasing potential snoring, lessening acid reflux and increasing blood circulation. Unwind with the relaxing head and foot massage. This adjustable bed base is a low-cost alternative to the more expensive ergonomic brands with the same features included and an alternative to a standard bed frame. Rest assured with a three-year worry-free warranty. Look for more innovative specialty sleep products from Modern Sleep. 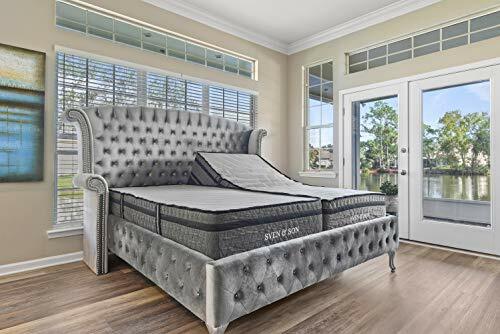 Signature Sleep Gold Power Adjustable Upholstered Bed Base/Foundation, Assembles in Minutes, Grey Linen, Twin XLCategory: Dual Adjustable BedsTake your sleep to the next level with the new Signature Sleep Gold Power Adjustable Upholstered Bed Base/Foundation. With endless possibilities for sleeping positions, this is a must! This bed base/foundation gives you flexibility and optimal comfort by adjusting with a remote control the upper half, lower half or both halves of your bed at the same time. 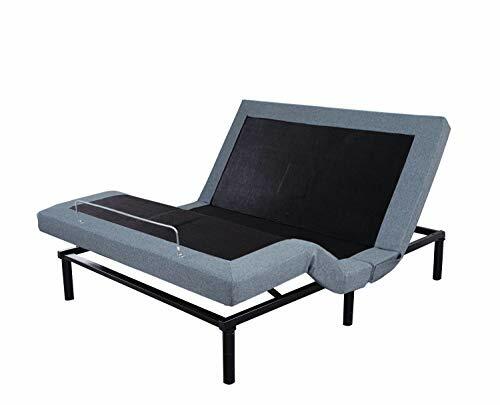 Furthermore, it is made out of sturdy durable metal and upholstered in grey linen to compliment the style of your room; it also has retainer bracket to guarantee your mattress will stay put no matter how high or low you are. The Signature Sleep Gold Power Adjustable Upholstered Bed Base/Foundation is available in two sizes: Twin XL and Queen. What’s more, you can put Twin XL beds side by side to form a King size bed with two halves that independently adjust – that’s right, you won’t have to fight your partner for the remote! Lucid L100 Adjustable Bed Base, 5 Minute AssemblyCategory: Dual Adjustable BedsBecome a part of the #flatfree revolution at a price you can afford with the Lucid L100 Adjustable Bed Base. With head and foot incline you can easily sit up in bed to watch TV, work on a laptop, or read a book without all those extra pillows. The L100 has a premium, responsive motor that moves your bed quickly and quietly without disturbing your partner. It is also fast and easy to set up. It comes folded for easy shipping, so when you get your new adjustable bed base, simply unfold it, screw on the legs, and plug it in. Attach the wired remote so you never lose it and you are ready to experience a new way of living and sleeping. With a 600-pound weight limit, 14-inch clearance, and a 5-year limited warranty, the L100 is ready to help you upgrade your downtime. 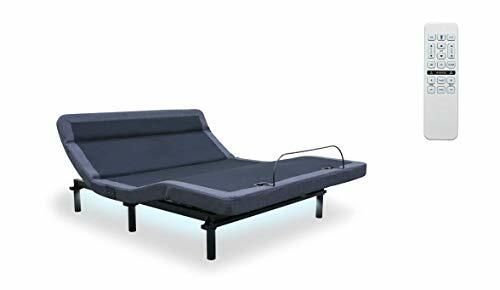 Classic Brands Adjustable Comfort Adjustable Bed Base with Wireless Remote ControlCategory: Dual Adjustable BedsThe ultimate high-tech sleeping option for the sophisticated individual, the Classic Brands Adjustable Comfort Adjustable Bed Base with Wireless Remote Control defines functional design. A sleek, fully-adjustable power base lets sleepers experience "Zero Gravity," a position that reduces body stress for deep, restorative sleep. A wireless remote controls head and foot elevations as well as a 3-speed dual massage function. Multiple USB charging ports negate the hassle of finding convenient power outlets. 6 legs and a steel retainer bar maximally support up to 850 lbs. and up to 425 lbs. for the Power Lift function. Upgrade your sleeping quarters into the 22nd century with this incredible fusion of technology and utility. Bed Dimensions: Twin XL: 39W x 80L x 15H in., 102 lbs.Full: 54W x 75L x 15H in., 123 lbs.Queen: 60W x 80L x 15H in., 146 lbs. Mainstays 7" Adjustable Bed Frame, Black SteelCategory: Dual Adjustable BedsSecurely support your box spring and mattress using the Mainstays Adjustable Bed Frame in Black. Fully adjustable to fit a twin, double and queen mattress and box spring, this highly durable bed frame is made from strong metal and features welded legs for supreme support no matter if the mattress and box spring are twin, double or queen. With an integrated middle support beam and built in headboard brackets, the Mainstays Adjustable Bed Frame in Black is the perfect piece to attach your existing headboard to, saving you time and money on a brand new bed frame set. Reliable and strong, the adjustable bed frame from Mainstays can hold up to 2000 pounds, supported on 9 sturdy bed feet. Designed with feet caps to protect your flooring from scratches or knicks, this durable, adjustable Mainstays metal bed frame also features thoughtfully designed slightly recessed feet to reduce the chance of stubbing your toe! Ultra easy to assemble at home with no tools required, the Mainstays Adjustable Bed Frame in Black is the perfect bedroom piece to adjust as your needs grow from twin to queen sized and is ideal for any bedroom from a child's to your master bedroom oasis. 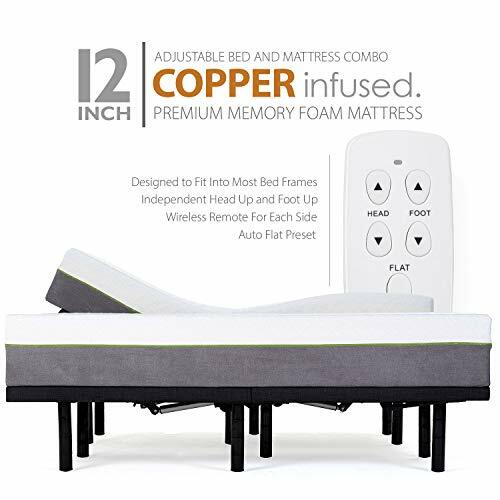 Modern Sleep Adjustable Comfort Affordamatic 2.0 Adjustable Bed Base, QueenCategory: Dual Adjustable BedsThe Modern Sleep Adjustable Comfort Affordamatic 2.0 Adjustable Bed Base is the perfect upgrade from a flat foundation. The head of the frame can be lifted in the perfect position to make it easy to read, watch TV, work on a laptop, and more. Plus, aids in sleeping in other positions instead of just flat. All these benefits at a low-cost alternative to more expensive ergonomic bed bases, now with a new wireless remote. Mainstays 13" Adjustable Steel Bed Frame, No Tool Assembly, Twin-XLCategory: Dual Adjustable BedsEnjoy the comforts of a fully adjustable bed frame at an afordable price! The Mainstays Twin XL bed frame with wireless remote allows for 70 degree elevation for your head and 40 degree elevation for your feet. No tool assembly is easy and is completed in minutes. Connect two Twin XL frames to create a full King size bed. 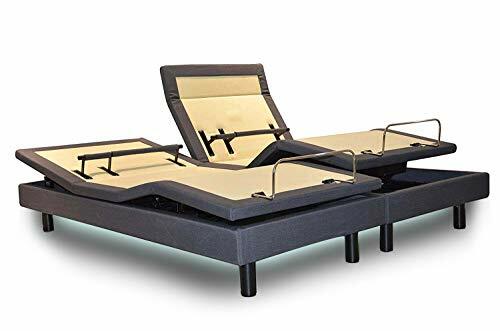 Leggett & Platt Symmetry EZ Compact Adjustable Bed Base with Head and Foot Articulation, Twin-XLCategory: Dual Adjustable BedsThe Symmetry EZ is an adjustable bed base with a foldable, compact design that allows for UPS-able shipping. With head and foot articulation, this base allows for many body angle adjustments that can potentially help ease stress, reduce soreness in the body, and moderate or eliminate snoring. The numerous position options allow you to receive the highest level of personal comfort and the sleep you need. The wireless remote allows you to control the full-body, head and foot articulation, while also providing a “Free-Fall” safety design feature. The Symmetry EZ base comes with (6) 10.5” steel legs for support and quiet motor that allows for a 700-pound total maximum weight capacity. A dark Gray upholstery and a powder-coated mattress retainer completes the look of this bedroom piece. We watch TV, read, play video games and work from the comfort of our beds. It’s also the oasis of a long workday, where we seek a tranquil environment that inspires relaxation and rejuvenation. 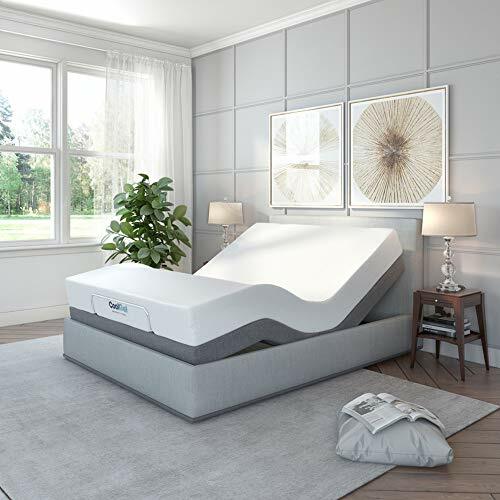 Besides being able to provide these needs, this base provides features to help promote a healthy posture during sleep with the user’s comfort in mind. 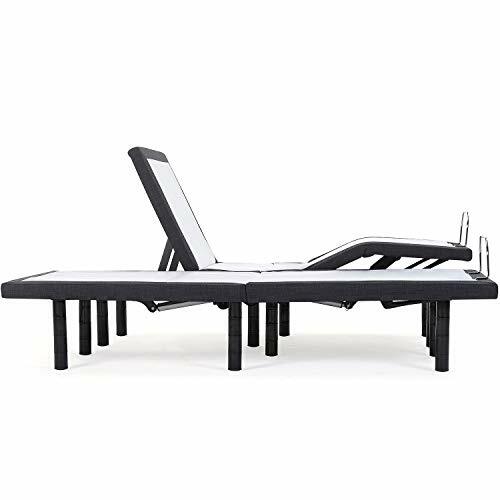 The Fashion Bed Group Symmetry EZ Adjustable Bed Base comes with a 1-year full product, 3-year parts and labor, and 25-year parts only warranty. 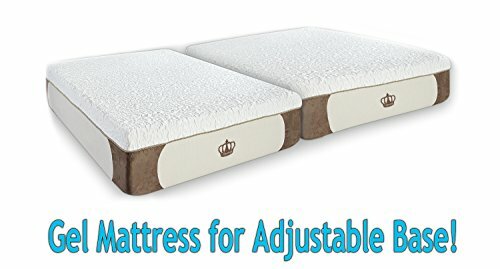 PostureCloud Adjustable Bed Base, Dual Massage, USBs, Three Leg Height Options, and Wireless Remote, Upholstered Ergonomic Bed, Multiple SizesCategory: Dual Adjustable BedsDon’t just choose a regular metal bed frame for your mattress, add the PostureCloud Adjustable Bed Base instead and you will love your decision. The super easy to assemble adjustable bed base is well made with solid construction and it works great. The many features of the base include separate ergonomic head and foot elevations, dual head and foot massage, dual USB ports, adjustable leg height options, and a wireless remote control with flashlight. The remote that has preset positions of zero gravity, anti-snore, tv, head and foot up, down, and flat, and separate head and foot massages that features a timer to gently ease you into sleep. The attractive upholstered frame includes a whisper-quiet motor that will not interrupt whatever you do in bed. The PosureCloud is a quality adjustable base and is a superior value for its price.